“Bartending at The Rose allows me to be creative, to use a color wheel that I get to taste,” says Meagan Schmoll. The bar was recently named one of the country’s Top 25 Cocktail Bars by Food & Wine. Jackson’s bars aren’t always just about drinks. Standing inside Eleanor’s … again! Bar & Grill, a dimly lit dive hidden in the back of Plaza Liquors—itself a dive liquor store guarded by a resident parrot and sharing strip-mall real estate with a Chinese restaurant, a drugstore, a ranch clothing store, and a laundromat—hundreds of people eagerly await a chance to roll a barrel of dice. The line goes from the wood bar out the front door. Literally. The Shake-A-Day pot has reached nearly $13,000. I’m not here for the Shake-A-Day roll—five of a kind and you win the pot—though. I’m here because sitting across the bar from Jeff “Handi” Hinnenkamp makes me happy. He greets me, by name, as soon as he sees me walk in. Often, before I can even snag a seat, he concocts some new, wild drink for me to try. A bartender myself—I’ve worked my way around the globe in numerous pubs, nightclubs, and fine-dining establishments—there are few other bars I’d rather pull up to at the end of the day than Handi’s. Having bartended and managed for thirteen years at The Cadillac Grille, a now-shuttered Town Square institution formerly frequented by locals in throngs, Hinnenkamp started at Eleanor’s in 2010. 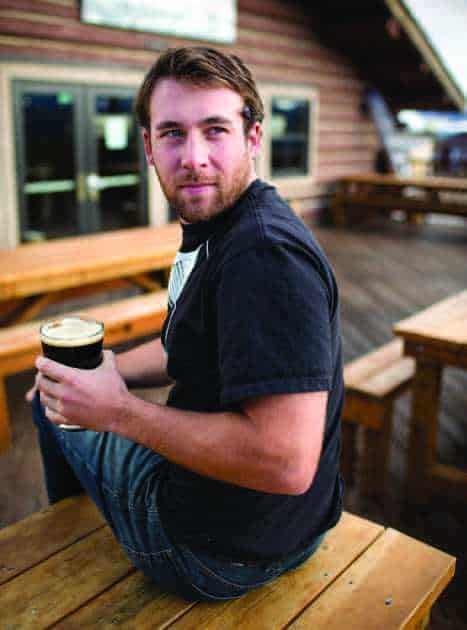 This year, the community voted him “Jackson’s Best Bartender” in JH Weekly’s annual poll of the best of everything local, from bartender to Realtor, masseuse, pizza, and everything in between. Hinnenkamp’s a laid-back kind of guy, always with a smile and a sense of calm about him. Even on a packed night with the Shake-A-Day crowd lined up out the door, he gets drinks out by the dozens and still manages to chat with those of us seated at the bar about our most recent Jackson adventures. Of course he refills our glasses before we have time to ask. I update him on my plans to climb the Middle Teton while watching him concoct some sort of horror cocktail involving Pop Rocks candy and a glow stick. Bartenders don’t get much more local than Hinnenkamp. 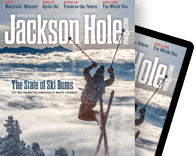 Jackson Hole has some incredible barkeeps—characters who keep us coming back as much to see them as to drink night after night. There are those like Handi, who make us feel like family, and ones whose cocktails we can’t help but return to for more. Schmoll’s “Flames of San Antonio” includes sage-infused Tito’s Vodka, Lustau Amontillado Sherry, Cocchi Americano, and sarsaparilla. MEAGAN SCHMOLL, MIXOLOGIST extraordinaire at The Rose, a classically inspired cocktail lounge with a speakeasy feel reminiscent of the Prohibition era, is a bubbly ball of bartending ingenuity. Just try to catch her with anything but a giant smile on her cherubic face. But don’t think she doesn’t take your drink seriously. 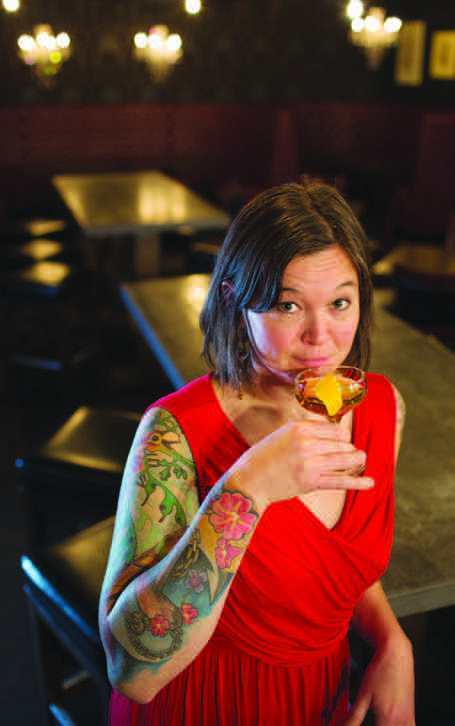 While “bartender” is Schmoll’s official title, her drink menu—presented as a leather-bound, hardcover booklet and including about three dozen original drinks—is proof she’s part-scientist, part-artist, and part-genius. “Bartending at The Rose allows me to be creative, to use a color wheel that I get to taste,” she says. “I organize and motivate everyone to develop cocktails,” she says when asked about her role as head of research and development for The Rose’s cocktail program. “We are constantly tweaking, sort of like a test kitchen, figuring out the most intriguing ways to balance a cocktail’s flavor profiles.” Food & Wine magazine recently rated The Rose, which opened in 2011 and collaborates with New York’s much-lauded East Village cocktail bar Death + Company, one of the country’s Top 25 Cocktail Bars. On any given night you can enjoy a classic cocktail made modern, such as an Old Fashioned infused with Co2. Or you can enjoy one of the lounge’s original creations, all made with fresh-squeezed juices and house-made syrups. You won’t ever find Pop Rocks or glow sticks in a drink at The Rose, but you will find wonderfully creative names and flavor combinations. 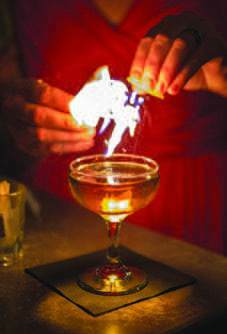 “Flames of San Antonio” has sage-infused Tito’s Vodka, Lustau Amontillado Sherry, Cocchi Americano, and sarsaparilla. A “Smoking Donkey Driver” is Kronan Swedish Punsch, dry sherry, Del Maguey Vida Mezcal, and chocolate bitters. The “Mayhem in B Flat” is George Dickel Tennessee Whiskey #12, muddled lime, white crème de cacao, and orgeat syrup. (FYI, orgeat is a sweet syrup made from almonds, sugar, and rose water or orange flower.) When Leonardo DiCaprio was in town last summer, he had a “Poodle Duty”—Tito’s Vodka, Dry Sack Sherry, strawberry, pineapple, lemon, and Prosecco. Bartender Nick Spaulding sits on the deck of The Bird with a German doppleboch called Ayinger Celebrator. AT THE SOUTHERN end of town, off Highway 89/191/26 and on a bluff overlooking South Park and the family friendly neighborhoods of Melody Ranch and Rafter J, The Bird is an old-school kitchen and bar. In summer, it has the best deck in the valley to watch the sun set behind the Tetons. Year-round, it serves some of the most wonderfully greasy burgers in town. From its Family Friday Nights to the controlled chaos of its Superbowl Sunday party to Sunday morning bottomless mimosas, The Bird is as one-off as the Hawaiian shirts its head bartender, Nick Spaulding, sports. WHETHER YOU’RE LOOKING for a place to play a game of pool or a dance floor with a bluegrass band belting it out for a two-step, the Million Dollar Cowboy Bar has it. And more. There are animal mounts on the walls. A Plexiglass box near the pool tables protects an entire (taxidermied) grizzly bear. There’s a full-service shoeshine stand near the front door. After you take in all of this, the fact that bar “stools” are actually western riding saddles isn’t even surprising. What else would they be? And then the entire place is built almost entirely out of knobbled pine, unique wood formations native to western Wyoming. Almost as unchanging as the decor is bartender Raul Degenova. Fifteen years behind The Cowboy’s bar, inlaid with silver dollars, of course, puts Degenova in an echelon of barkeeps few and far between in this Wyoming town. Degenova has seen it all in his career here—from wedding receptions to barroom brawls to John Popper, harmonica virtuoso and frontman of the rock band Blues Traveler, spontaneously jamming with the house band.